After racing on Ladies Day on Friday, Aintree's Clerk of the Course, Andrew Tulloch, said that some water would be put on the landing side of fences on the Grand National course ahead of Randox Health Grand National day tomorrow. He explained: "The track has dried out during the day today, so it is now Good to Soft on all courses. The ground on the Grand National course is still a bit easier round the Canal Turn. "We are aware that the Grand National is now run at 5.15pm, quite late in the day on what is predicted to be a dry day, so what we will do this evening is water all the landings of all the fences with our pop-up automated watering system, because safety in the landing areas is paramount. "The forecast for tomorrow is for a dry day, so the ground will gradually continue to dry out." The crowds on the first two day of the 2019 Randox Health Grand National Festival have been very similar to those of 12 months' ago. Yesterday, Grand National Thursday, saw a crowd of 33,020 in attendance (compared to 33,500 in 2018). Today, Ladies Day, saw 49,602 in attendance, just below the 50,000 sell-out crowd seen in 2018. Dickon White, Regional Director for Jockey Club Racecourses North West, said: "Our pre-sales were at the same level as in 2018, so our crowds have held up very well indeed given the weather over the past two days. "Today we saw the second highest-ever attendance on Ladies Day and our attention now turns to tomorrow, Grand National Day, when we will welcome a sell-out crowd of 70,000 to Aintree Racecourse." Sue Moon, 50, an account manager for an agricultural engineering firm, is the winner of the Aintree Style Award, winning a Range Rover Evoque and Chi Chi London dresses. 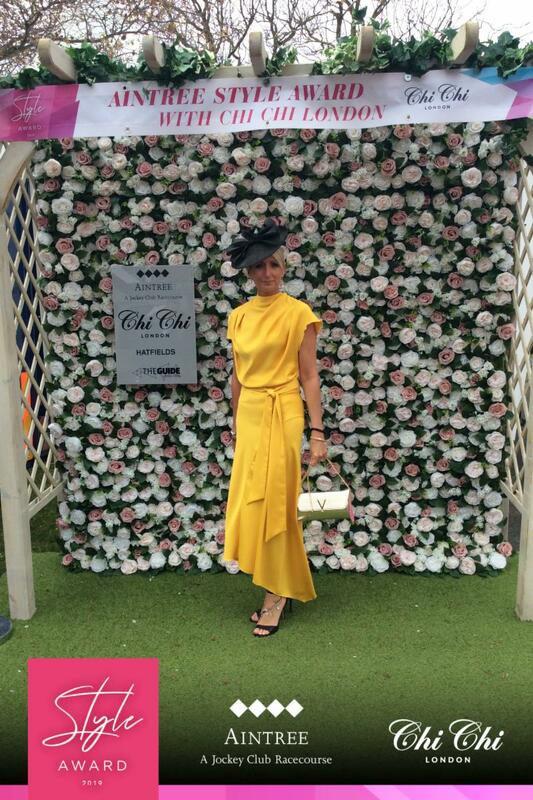 Moon, who is mother of Leah, and wife to Simon, is from Euxton, Chorley, Lancashire and bought her dress bag and shoes from Seasons in Clitheroe and acquired her hat from a boutique in Windermere. An enquiry was held to consider the circumstances surrounding the non-arrival of Ciaran Gethings, who was declared to ride PUSH THE TEMPO (IRE), trained by Robert Stephens, and the substitution of Tom O'Brien. Tom O'Brien and Robert Stephens were interviewed and the riders' agent, who was not in attendance at the meeting, gave evidence via telephone. Having heard their evidence, the matter was forwarded to the Head Office of the British Horseracing Authority for further consideration. Permission was given for MOUNT MEWS (IRE) to wear a hood in the Parade Ring only and to be mounted on the track. Approaching the home bend on the first circuit, ADMIRAL BARRATRY (FR), unplaced, edged slightly left crowding BRIO CONTI (FR), which was pulled up, onto PUSH THE TEMPO (IRE), unplaced, which in turn tightened DOCTOR DEX (IRE), placed sixth, which caused MOUNT MEWS (IRE), unplaced, to be checked on the rails, but after viewing a recording of the incident, it was found that no riding offence was involved. Entering the bend leaving the back straight on the first circuit, a free-running CANARDIER (FR), placed third, shifted left when steadied off the heels of MOUNT MEWS (IRE), unplaced, tightening KNIGHT IN DUBAI (IRE), placed fifth, onto JOKE DANCER, unplaced, which had to be checked, but after viewing a recording of the incident, it was found that no riding offence was involved and that it had not improved the placing of CANARDIER (FR). Jack Kennedy, the rider of the winner, THREE MUSKETEERS (IRE), was suspended for 4 days for using his whip above the permitted level from the third last hurdle. Following the race, Nico de Boinville reported that KOBROUK (FR), which was pulled up, ran too free and the Veterinary Officer reported that CALTEX (FR), placed eighth, lost its right hind shoe. Harry Cobden reported that BRIO CONTI (FR), which was also pulled up, stopped quickly and the Veterinary Officer reported that a post-race examination of the gelding during routine testing failed to reveal any abnormalities. PRECIOUS CARGO (IRE) wore earplugs. R. Walsh, the rider of ARAMON (GER), placed second, was suspended for 2 days for using his whip above the permitted level from after the final hurdle. The performance of PRECIOUS CARGO (IRE), which finished sixth of seven, was considered. Nicky Henderson could offer no explanation for the gelding's performance. The Veterinary Officer reported that a post-race examination of PRECIOUS CARGO (IRE) failed to reveal any abnormalities. Permission was given for POLITOLOGUE (FR) to parade out of order in that the gelding would parade first. Following the race, the Veterinary Officer reported that POLITOLOGUE (FR), placed second, bled from the nose. Permission was given for DOITFORTHEVILLAGE (IRE) to wear a hood in the Parade Ring only. Permission was also given for SUB LIEUTENANT (IRE) to go early to post and the gelding wore earplugs which were removed at the start. BALLYHILL (FR) wore earplugs. FLYING ANGEL (IRE), placed sixth, ran without its declared tongue strap as Nigel Twiston-Davies had been unable to fit the equipment. The trainer subsequently reported that the gelding's performance was not affected by running without the tongue strap. Following the race, Harry Cobden reported ADRIEN DU PONT (FR), unplaced, jumped poorly and Jack Quinlan reported that MERCIAN PRINCE (IRE), unplaced, stopped quickly after the final fence. The Veterinary Officer reported that ACTIVIAL (FR), unplaced, lost its right hind shoe and KILCREA VALE (IRE), unplaced, lost its left fore shoe. The Veterinary Officer also reported that O O SEVEN (IRE), placed eighth, bled from the nose and that POLIDAM (FR), which was pulled up, was lame on its left hind. EMITOM (IRE) wore earplugs which were removed at the start. The Stewards wished to hold an enquiry into Harry Skelton appearing to ease ARDLETHEN (IRE) down after the last hurdle, before commencing to ride his mount again on the approach to the finish line, to be placed eighth, beaten a head for seventh place but were unable to do so as Skelton had left the course. They adjourned their enquiry to Aintree on Saturday 6 April 2019. Approaching the bend leaving the back straight on the final circuit, TREVELYN'S CORN (IRE), placed tenth, edged slightly left causing the rider of the free-running winner, CHAMP (IRE), to take back, which in turn caused DOWNTOWN GETAWAY (IRE), placed seventh, to shift left tightening THE CAPTAINS INN (IRE) on the rails, which was quickly pulled up. Following a post-race examination, the Veterinary Officer reported that THE CAPTAINS INN (IRE) was lame on its left fore and Daryl Jacob reported that, in his opinion, the gelding had sustained an injury before the incident took place. After viewing a recording of the incident, it was found that no riding offence was involved. Following the race, Jack Kennedy reported that DALLAS DES PICTONS (FR), unplaced, lost its action after the final hurdle and the Veterinary Officer reported that a post-race examination of the gelding during routine testing failed to reveal any abnormalities. On the run to the finish line on the first circuit, a free-running SANTA ROSSA (IRE), placed third, clipped the heels of THE COB (IRE), placed seventh, and stumbled, but after viewing a recording of the incident, it was found that no riding offence was involved and that it had not improved the placing of SANTA ROSSA (IRE). Following the race, Alan Johns reported that HAZM (IRE), which was pulled up, hung left and stopped quickly.